I am visiting the incredibly talented, successful, and uber-resourceful Elizabeth S. Craig today. I’m discussing the ultimate in networking opportunities and the new IWSG book. Please stop by! RiffTrax Live – Santa Claus! 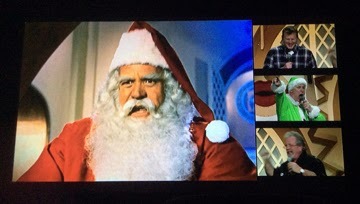 Last week the RiffTrax crew – Mike, Bill, and Kevin – took on a film for the holidays: Santa Claus. As always, it was hilarious, and Mike, Bill, and Kevin had no trouble making fun of the film. If you’ve never seen a broadcast of the show, you need to catch the next one! Blogger buddy Susan Kane got to go see the show as well last Thursday, which was her birthday! Before the show, they present a series of slides. Here are some for your enjoyment! At the A to Z Blog today is Cat Starr from Astral Traveller and her theme of travels around the world. This Wednesday, the IWSG site welcomes the amazing Sylvia Ney as she discusses the benefits of writing for small markets. For her IWSG post last week, Chrys Fey wrote the most awesome and hilarious poem, ‘Twas the Night Before IWSG Day! Thanks to everyone who downloaded the IWSG Guide to Publishing and Beyond! And it's finally free on Amazon! And thanks to MJ Joachim who review the IWSG book last week. Gary Numan beat… Gary Numan. Ironic, huh? That got me to thinking about the way I write now as opposed to pre-publication. It took me almost a year to write my first book. (Not counting edits.) The three books since that time have taken two to four months for the first draft. And of course now, I do have author duties and an online presence that takes a chunk of my time. Looking back, I realized that first book was written in sporadic, stolen chunks of time. The other three were written during dedicated blocks of time. The big difference, despite the extra demands on my time, was my focus. I knew I had to get them done and set aside three-five hours to write every single night no matter what. So, that’s how my writing habits have changed. Have yours changed? Anyone else catch RiffTrax last week? (Or had the misfortune of seeing that film without RiffTrax’s help?) Catch Chrys’ post? Downloaded the IWSG book? Getting some new books? And have your writing habits changed? Don’t forget to visit Elizabeth S. Craig! And not posting again until next Monday, so see you then. And - switched to embedded comments to get rid of stupid word verification. Love the idea of a Santa Claus film with a carny flavor! Thanks so much for being my guest today! More focus is good! My writing habits have become more set in stone since my kids have gotten older (and a little less flexible, since I'm not usually interrupted now). Seen the IWSG guide. It is great as those were written on empirical efforts and should be very accurate and very useful. Interesting to see that there ought to be change of writing habits and discipline if one expects to be really productive. Hopefully Amazon fixes the price problem soon. That must be frustrating. The Santa movie sounds entertaining, in an odd way. I like odd. thanks so much for featuring Claudia today! Movie sounds fun. And I love what Rachna had to say. For me, still editing my first book, I find my time to be sporadic, stolen chunks of time. That's so interesting how being focused help you write quicker. I'm struggling to find the time with all the other things like work and my daughter that take up my time. Hoping to start writing some on the weekends after the first of the year. Those are funny. You know, I think there really was a Star Wars holiday TV special. Dedicated time and focus is the key for me too! I will visit Elizabeth! Have a great week, Alex! Elizabeth, thank you for having me. Donna, and it was awful! Sandra, right! My first drafts are certainly cleaner now. P.S. Just started your new book. Amazing first line! I wish I could write a whole first draft in a few months but it never seems to happen. 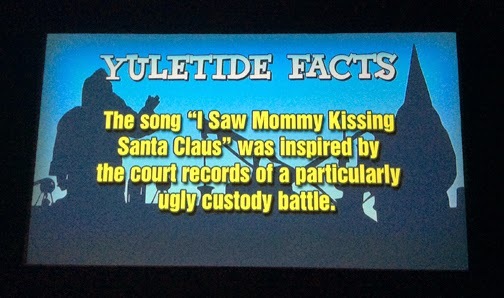 Love the Yuletide facts - especially the one about the custody suit. Ha! LOL - a branch with Groot written on it. I don't think I write much differently now then I did before publication. Maybe a little faster. Time is always a challenge. This book (that you're reviewing) took years to write because I didn't know what I was doing until a few years into the work - kept shifting theme/focus....I'm hopeful it'll get faster, not slower. I have never figured out how you do any of the things you achieve. Okay, the movie has always freaked me out a little. So many head-scratching moments. It's weird, yet entertaining. I knew Gary Numan would win!!! RaffTrax does look pretty funny and I love the slides... always good to keep a little humor in the mix. Madeline, she did awesome with that poem. Jo - clones. I keep telling you, clones! My writing habits have gotten more focused and more regular as I became more serious about it. Have a wonderful holiday, Alex. Focused writing. Yah, you need that time. I don't think I'd watch the rifftrax movie. I saw Mommy Kissing Santa Claus is a fun song who knew it's background? I have my own copy of IWSG book. Very cool. Yes, reading through the book, but at this writing business for many years, but there is always something I can learn. heading to Elizabeth's now! My writing habits have changed! I'm so slow with it. When I have a deadline I move at lightning speed, but with the holidays I have to force myself to write! Sounds like Riff Trax saved the Santa movie. Thanks again for the IWSG book--it's getting me ready to finish formatting my book to upload. Some great advice in there. Writing with purpose does seem to be a good thing that comes with experience and other demands on your time. Have a great week. Yes, Gary Numan fantastic !!! I do like the slide about finding out your Secret Santa. Very funny. My writing practices have changed. It became more of a job than for fun, but now I know people want to read stuff, so I have to apply myself more. I see your word verification is still on, too. Thanks for telling me. Not sure why that is happening. I loved Chrys' post! Very funny. I finally gave up waiting for Amazon for the IWSG Guide and went to Smashwords since you can just download a Kindle version through them. Santa, the devil, and Merlin? That is an unexpected combo!! My writing habits are different for revision and first drafts. For first drafts, I need dedicated time -- usually late at night. For revision, I can write any time of day, for ten minutes or hours. Argh! I'm not sure I can read the Captcha below ... let me get my bifocals. Hehehe, I love Chrys! I'll head over. That yuletide fact shocked me. WOW. I had NO idea. How did you find this out? Can you imagine having a song like that after a part of your life. RiffTrax Live Santa Claus sounds like my kind of movie. I guess when you have deadlines, you'll find the time to write, even if it takes time out of your sleep time (which is exactly what I have to do to get anything significant done). Beth, that's why I need NaNo to prod me into action. Shell, awesome it helped you! Heather! I can't turn it off. Damn them. Sarah, that's what we've been telling people. But just found out it's free now! Dianne, sorry - everyone's is on. 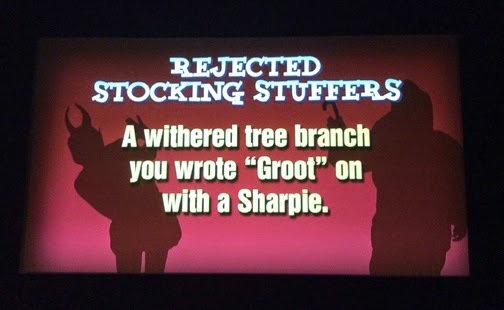 Robyn, the Groot branch was my favorite. haha the groot branch was great. Oh yeah writing has changed as I have a little less time then before with all the other online stuff, but oh well. Thanks for the shout too. And dumb WV seems to be switched on everywhere today, including here. I haven't seen Riff Traxx alhhough it was playing close by. Just too many things overlapping at once. But I'll check out the Web site in more detail and see what's available from past episodes t o view. I'll check out Pat Hatt's book as we have a common theme of cats going on. And yes I downloaded the IWSG book and scanned through it. Will start reading it today. 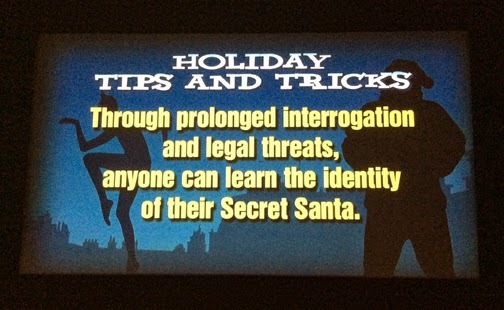 The Santa movie sounds funny and the slides are hilarious. Congrats to all who have new releases. That movie sounds absolutely crazy, totally worthy of being spoofed. I do tend to get more writing done when under a deadline, but I've always been sporadic. And is there a reason I'm seeing so many bloggers with the "please prove you're not a robot" verification thingy? Is this something I need to look into? I actually looked up Rifftrax because I wanted to see this... the nearest theater that has this is over 30 minutes away. What the hell, Denver? I may still trek out there one day. This sounded hilarious. Also, what Bish said. I'm noticing captcha suddenly on a ton of blogs today (including this one)... was this an auto update that people aren't aware of, or is everyone just that passionate about spam blocking? Riff Trax rocks! They can make any bad movie enjoyable. That one slide also made me eager to watch their treatment of the Star Wars Holiday Special. It's certainly the time of year for it! Enjoyed the post, trying to catch up with my comments. Who knew all that about Santa? What fun. Congratulations to all the new books. I have the IWSG book and hope to read it soon. Advice is always welcome. Hey Alex! I read all of the chapters of Blogavengers that Pat posted, so I'll be sure to download the book. I'm currently reading his wild and fun Max Blizzard novel. And I did catch Chrys's hilarious poem last Wednesday. Rachna Chhabria's post was spot on. I am much more productive on a schedule, but it's fallen by the wayside during this holiday season ~ maybe a shorter schedule right now. Are you thinking about book five??? Have a great week! I loved Chrys' poem. It was funny. Focus is the big difference for me in being productive during my writing time. I've even started turning off the music. What the heck is up with word verification today. It's been active on every blog I visited today. Pat, you're welcome. And I know! I can't shut it off. Bish, everyone's is turned on. Sorry! Brandon and Bryan, go!! And everyone's is turned on with no way to turn it off. Fundy, no book five at the moment! Your bit about giving yourself a few hours to write each day makes a lot of sense. Writing, blogging, life etc. are all time consuming. I suppose it's about setting priorities and making things happen. If we want it bad enough, it will happen no matter what. If it doesn't, we have no one to blame but ourselves. No worries about captcha - I've seen it on a few blogs today from bloggers I know don't use it, so it must be some sort of a glitch. Santa Claus with a carny flavour? Creepy - and fun. Which works for me. Word verification has been popping up on a number of blogs, and the owners are still working to get it off of their blog comments. Everybody's got word ver. on today. I believe we have gremlins afoot. Saw Chrys' post and love it! Already have IWSG book in my Kindle and reading it a bit at a time. Thanks for the laughs in that series of slides! It depends how long and involved a book is. I've poured out super-long first drafts in just a couple of months, and taken only a month or so for my much-shorter books, while other books can take a year or more. My handwritten magnum opus has been in the works for over 20 years now, and that's just the first draft. I haven't even started transcribing it and doing my planned radical revisions and restructurings of the earlier parts. Interesting how your work habits changed. I haven't published a book yet, but I am getting faster with each book. My first book took me years to write, but I also had babies at the time. Now it usually takes me about 3 months to write a first draft and up to a year to edit it, depending on the feedback I receive from betas. I've been enjoying reading the IWSG book! Focus and dedication will see you through in achieving your dream. I would have loved to have been in the audience with you. Santa Claus with a Carny Viewpoint! Can't stand the word verification. I took it off mine quite some time ago. LOL slides. I've downloaded the IWSG book and I'm enjoying it. I'm over the moon to be included! I'm making all my men a Groot. As nerds, they will totally love it. It is easier to block chunks of writing time once you have a book in print- having evidence that you're not totally just playing is helpful. I visited Elizabeth's and had an idea for an IWSG post- foods to cook that take less than twenty minutes. That way the IWSG can cook us dinner too! I like embedded comments and hate word verification. Haven't had a chance to get the IWSG guide yet but I need to get myself in gear and get over to Amazon. 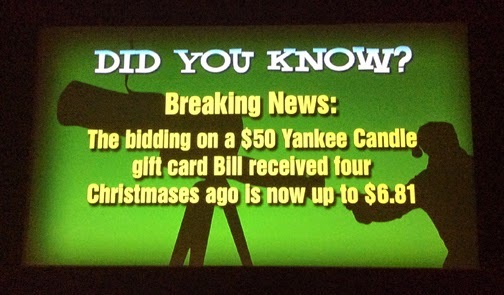 Love the Yuletide Facts LOL. Well at least I voted for one winner in last weeks BOTB. I have got to go and download the IWSG Book right now before I forget. Thanks for the reminder. Only just caught Chrys's poem, what a great read. I'm sure a deadline helps to maintain focus. I'll have to check out Chrys' poem! I'll also be on the lookout for RiffTrax. The IWSG Guide looks great, and is a wonderful resource for all of us! It's amazing how your writing habits have changed Alex, and you're more driven than ever! Congrats to all of the authors! So fun! I meant to check into that. I'm off to Elizabeth's blog now. I just downloaded the IWSG book for Kindle. Looking forward to reading it! Elephant's Child, I did and that seemed to help. Donna, we appreciate you contributing! Elizabeth, that made me chuckle. Hope you have a great week, Alex. Cya 'round cyberspace. My biggest change is that I now have more than one project going, which I kind of hate but don't really know how to get away from, right now. Something about Christmas just inspires people to make bad movies. I think I write all my books differently. At least that's consistent. Having a devoted amount of time is probably the key to getting things done. I used to be better about such things, and I'm hoping to get back on track this coming year. The Groot slide is hilarious! I watched Guardians again the other night and still love it. I've been a bit sporadic with my writing, but then a lot has been going on for me at the moment. I think I set aside time differently now. I did try to do something super-crazy though with my third book and it backfired a bit on me - I tried to do a mega-outline for it (gasp), not my style. After an attempt to write a rough draft from that, I had to back up, pare down the outline and start over. Now, it's almost done . . . but it has taken me longer than book 2. Agh. Oh well. I'm still learning, and I'll still be learning years from now. I am still having trouble with that darn word verification even though I embedded my comments on my blog~! I used to do marathon writing sessions; now I fit it in whenever I can, but I am more focused and know what I need to accomplish during a dedicated time. Thanks for the tip in regards to changing the comment box to embedded, I will give that a try. As for changes in writing, most definitely. First draft of first book took about 2 months, with the remaining edits taking the remaining 8 months of the year (started in February). The others I have on deck have taken on average about 6 months to write (novellas) with about that same length of time for edits, etc. Some friends and I went to see RiffTrax: Godzilla this summer. Those guys are great. Congrats to everyone on new releases. Anxious to read IWSG. What a wonderful undertaking. Time. What's that :) I think that for me its so important to stick to a schedule. I need chunks of time to write so I can get into the story and get lost. Darn, I missed the RiffTrax--I'll try to catch it somewhere. I LOVED the slides for their show. I'm gonna buy the IWSG book tomorrow (I still haven't figured out why my Amazon account is easier to access on my work computer compared to my home one). Congrats to the writers with this week's releases! May their books sell like crazy. Chrys' poem was great. I read T.B. 's book and enjoyed it a lot. I also enjoyed the IWSG anthology. I'm glad to read it took a year to write your book not including edits - that makes me feel a bit better for taking so long with my book. It's not the initial part that takes so long, it's those blasted edits! The evil cat released yet another book?! Geez Louise!! He never stops. Joshua, I need those chunks as well. Helena, it's now free on Amazon! Elsie, no worries how long it takes. I agree. Writing time vs. duties does change. It took me 2 1/2 years to write and polish Come Back. I should finish the next one in less than a year, but I'm having trouble finding big chunks of writing time. I am definitely writing way less right now than I have at points in the past. But I don't have the excuse of having been published, getting in the way. ;) I blame the cats! ha. The book I'm querying now took me four years to write- I never want to do that again! And there were computer problems, burnout, pregnancy, and then a baby that compounded it all. Really looking forward to reading that ISWG post tomorrow! I'd say my habits have changed as a writer- I make writing more of a priority than I used to, but marketing and promotion also takes a huge chunk of time, so my waking and sleeping hours have changed to fit the needs of myself as well as all my other obligations. It's a hard balance, one that might get easier overtime, but will also be ever changing as parts of my life ebb and flow. My writing has changed the same way. I also think that as I learn to write better and become familiar with the process, the story comes out quicker as well. Yes, my writing has also changed. My first book took years to develop. It's gotten somewhat easier as I've been learning more and how to manage time. Although, I never feel the editing is every over. That's when you have to say enough is enough! Finding time to write is tough this fall because of book promo and my work on the Rocky Mountain Fiction Writers Blog. I have a manuscript I want to wrap up before the end of the month, so I have no choice but to set aside those blocks of time you talked about, Alex. I'm starting Sunday, right after my "one big booksigning and party" is over. Yes, my writing has changed, maybe I am not focussing enough. I need to take a leaf out of your book and focus and dedicate atleast three to five hours everyday, that way I may finish the book fast. Though I feel I am writing faster now, but there are always other things vying for my time. So the writing time is getting reduced. Btw, I saw Interstellar on Sunday, what did you think of the movie? I loved it. Thank you for mentioning my IWSG poem! I'm glad you enjoyed it, but you spelled my last name wrong. ;) Finding time to write now is tough. It was easier when I first started out and was writing with the goal of being published without actually being published. Once I started blogging and published Hurricane Crimes my writing time has diminished. And that's for a short story! Not even a book in print that requires book signings! Visited Elizabeth - not sure I'll ever publish anything but may download the information. (I can always use help). "Prolonged interrogation - legal threats- Secret Santa" I'm in trouble! I plan to get Pat's book as my gift from me to me for Christmas. He is so funny! Thank you visiting my blog home. Enjoy your time away! I write more quickly now that I have an idea what I'm doing. Still a pretty slow writer, though. Too funny on those screen cards! Yes, got my book. Yes, checked out Cat on A to Z. She rocks and I wish I'd been almost everywhere she's been. Yes my writing habits have changed. I liked it when all I had to do was write. I like blogging, but other than that, I wish all I had to do was write! But I am taking on the challenge of marketing and think I might be making progress. Great post, as usual! Leandra, the next will be better. Patricia, you can do it. Rachna, I thought it was really good although a bit depressing. Chrys - crap! I'll fix it. I had a whole lot to say, really... but by the time I reached the end of the line, I couldn't remember. Oh, right, I saw Chrys' poem. It was so awesome. I had more to say, but like I said... I can't remember what I was going to say. Congrats to everyone on their new book releases! Catch Chrys’ post? Yes. It's super-creative! Downloaded the IWSG book? Definitely. Will post a review within the next week. Getting some new books? I have a TON of new books, thanks to the16 e-books and $65 in Amazon gift cards that I won during October/November. My writing habits have changed, but not for the better. I steal any moment I can now, but I wouldn't change that...much. My children consume more time, but I love them and wouldn't trade them for all the writing time in the world. :) Hopefully when they get older, I'll have a bit more time though. Loved your post on Elizabeth's site! I guess I'll have to check out those RiffTrax, they sound hilarious. I have tried to make solid time for my writing but it hasn't happened and I end up squeezing writing/blogging/social media all into one time slot. I'm determined to change that for 2015! Joylene, sorry. Blame the embedded comment box. Brian, let me know how well that goes over. Michelle, that's a lot of books. Annalisa, tell them about a cheaper price! My writing habits have changed since my pre-publication days too. For one, I don't work on my novel everyday. Sometimes it's because I have emails to answer, or marketing plans to work on, blog post, etc. Other times it's because the day job has just zapped all my energy. When I do write, the time is well spent. Thanks for sharing the slides. I'm off to check out your guest post. I'm trying to talk Husband Unit into watching Santa Claus vs. the Martians. He's less than enthused. I may have to watch it alone. My writing habits have changed. I found ways to change my schedule to devote more time to it and it multiple projects at once (deadline permitting). This has had to be a whirlwind visit. I'm running terribly behind. I have no writing habits. I just write when I get the urge. Although, during a life-changing situation, my writing has gone way into the background. Then again, something to write about. It looks like I'm going to have to revert to this style of commenting on my blog. I changed it so folks wouldn't have to scroll so far down. Now with that unasked for word verification, it seems I must change back. All the best, good sir. "I Saw Mommy Kissing Santa Claus." Ahhhhh, nothing says the holiday like Yuletide Adultery! Glad Amazon fixed up their prices for IWSG Guide To Publishing. Very interesting blog Starrl Cat !! really wonderful! Mary, you might have to watch the MST3K version of that one. Gary, the word verification is annoying. Heading over to Elizabeth's. I also switched to embedded. Thanks for the tip. I get up at ridiculous o'clock every morning (except Sundays) to write before the distractions of the day take over. It's taken me about ten months to tease out my first novel. I'm looking forward to seeing how my writing days change once published. Happy holidays to all and wishing you continued successes throughout the new year. Congrats to Pat, Sean, and TB on their releases! Woohoo! Very interesting to read about how Rachna's writing time is different now from her first book. Go Rachna! Please bring back the pop-up box. Scrolling up and down so I don't miss mentioning different parts of your post is a pain. I'm really changing my habits--writing and otherwise. I never try to do that in a New Year's Resolution, so now's the time. Hope you have a good break. We need those, especially this time of year. See you next Monday! P.S. I'm enjoying the articles in IWSG Guide to Publishing and Beyond! Also I'll pop in to say hi at Elizabeth's blog. gulump, gulump, gulump--fine moments by a fine actor. Lee, that's good to hear! Blue, but I could! You want mine? I need to get a handle on my writing time, just trying to find a balance. 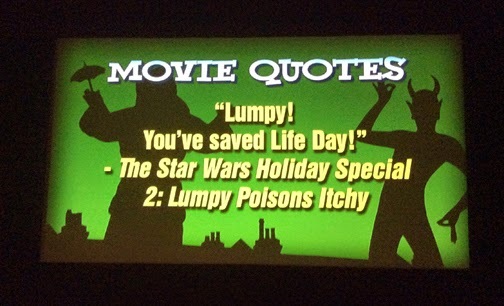 The RiffTrax slides are great. Sounds like the whole experience was pretty cool. I think the reasoning Rachna Chhabria can serve for writers of success! My fourth book is taking a lot longer than my first. Then again, it wraps up the series, so there's a lot more to keep track of! I must get across and read Rachna's secrets to writing! Alex, I wish you and yours a very blessed Christmas time and all the best for 2015! Kim, I hope you do. Claudia Must Die is a great read -- enjoyed it. Hi Alex, regarding your question on my blog as to what name did my editor give the watchman's cat in my story, she gave it the name Imarti (a traditional name). 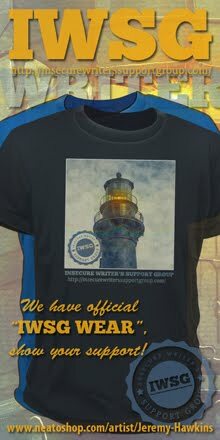 I just downloaded my copy of the IWSG Guide. SOOOOO happy to have it. Hopefully 2015 will be my year for publication. So much has happened this year for me with design work, selling my condo, and finally moving. CRAZY. My offer for the NY COOP I wanted to buy has just been accepted...YAY! I'll be HOME for next Thanksgiving and Christmas. I am so happy just thinking about it. Another year in Chicago is fine. LOVE my new place and I finally got it put together this weekend. Perhaps now I can visit everyone.... It's amazing how time consuming moving is. I am also psyched about attending the SBCWI Conference in NYC. in February. It will be an awesome week, with the conference AND closing on my coop..... THINGS are looking up! HURRAY for 2015!!!!!! I wish you a happy 2015 ! A very Happy New Year, Alex. Thank you for visiting me in 2014!